Females continued buying licenses in record numbers in 2015-16. Danielle Miller, of Mifflin in Juniata County, grew up in a hunting family and always loved the outdoors, then got her first hunting license at age 22. Females continue to join the Pennsylvania’s hunter ranks in record numbers, with 96,555 females buying licenses or permits in 2015-16. 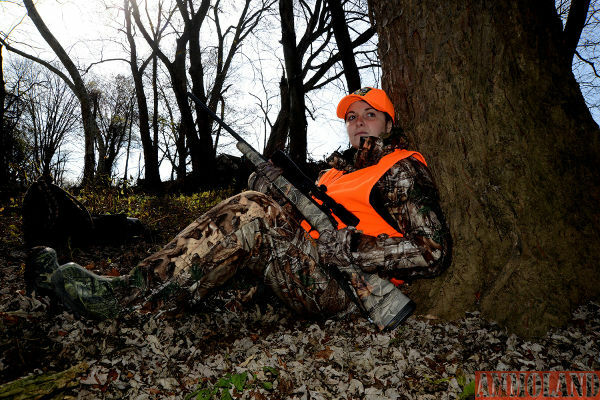 Harrisburg, PA -(AmmoLand.com)- You might say Jillian Katchko was born to hunt. “My Grandma Anna said my grandfather took the same kind of photos of my dad and his brothers when they were kids,” she said. Naturally enough, Jillian wanted to take part in this family tradition. When she turned 12, she became certified through a Hunter-Trapper Education course, then got her first license and headed afield with her dad. She was quick to make memories, too, taking her first squirrel with her .22 rifle at 22 yards, then encountering a 4-point buck in deer season that didn’t quite offer a good enough shot. But she can’t wait for the new season to kick off. “Hunting is just plain fun,” Jillian said. Each year, more and more females of all ages are finding that statement to be true. During the 2015-16 season, 96,555 females purchased Pennsylvania hunting licenses or mentored permits. That’s more than 10 percent of all license buyers, and yet another increase for this rapidly growing demographic. Since the 2009-10 license year, when 67,165 females bought licenses, participation by females has grown by more than 44 percent. It’s not all due to teens like Jillian. In fact, the fastest-growing age range among all Pennsylvania hunters is women ages 26 through 30 – a segment that’s grown by nearly 26 percent in the past three years. Danielle Miller, 29, is part of that group. A resident of Mifflin, Juniata County, Miller also grew up in a family of passionate hunters – all of them men. She loved the outdoors, but it took a while for her to realize she was a hunter at heart. “I guess, growing up, I assumed that hunting was just something that men did,” she said. “My brother was always my dad’s sidekick, and it was a given that he’d hunt. I don’t ever recall being asked if it was something I wanted to do,” she added. As she grew older, Miller realized what defined her as a person, and decided that hunting was something she wanted to do. At 22, she took the Hunter-Trapper Education course and got her first hunting license. Today, she enjoys hunting not only with her dad and brother, but also her boyfriend and his daughter. Considering the growing numbers, that must be a sentiment shared not only by female hunters in Pennsylvania, but across the country. Southwick Associates, a fish and wildlife statistics firm based in Florida, says females are the fastest-growing segment among all outdoors users in the United States, and there now are about half a million female hunters nationally. The natural question is why, but it’s a difficult one to answer, said Game Commission human-dimensions specialist Coren Jagnow. Survey responses have hinted at possible explanations, Jagnow said. Females have demonstrated different reasons for wanting to hunt. They’re much more likely than men to take to the field to harvest game for meat as their No. 1 motivation. The question could be explored through further research. But there’s still no clear answer as to why the number of women hunters is growing so rapidly, Jagnow said. But there’s no mistaking they’ve taken to hunting, and not only have joined the ranks, but stayed. And the enthusiasm they’ve demonstrated is great for hunting in Pennsylvania, said Game Commission Executive Director R. Matthew Hough. Mary Ann Zdarko, of Warren, in Warren County, wasn’t raised in a hunting family. But when she remarried at 47, her husband, Dan, encouraged her to come along and learn what hunting was all about. They often hiked in the woods together already, and she took the Hunter-Trapper Education course and began making frequent trips to the range to practice with her rifle. Now 69, she has taken 10 deer over several seasons. Then, six years ago, she was drawn for a bull-elk license and harvested a nice bull. “The elk hunt was an amazing experience, especially because I was 63 – no spring chicken – at the time,” she said. But Zdarko said she’ll continue to hunt as long as she can walk in and out of the woods. This post Women Bolster Hunter Ranks appeared first on AmmoLand.com Shooting Sports News .